This is the basic operation of a fire extinguisher. 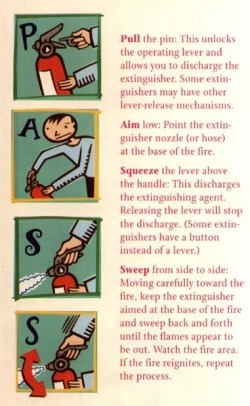 Only use them if the fire is small. Otherwise, escape and call 911. The coloring book has various safety-related items: electrical safety, cooking safety, smoke detectors, evacuating when your house is on fire, and not playing with matches. Take time and color some with your kids.